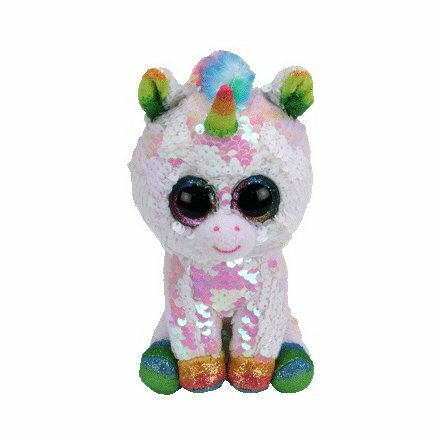 Pixy is a unicorn covered in flippable sequins that alternate between pearly white and pink when you run your hands over them. She has large, glittery rainbow coloured button eyes and a rainbow coloured horn on top of her head. Her front hooves are sparkly orange and the hooves on her back legs are sparkly blue. She has a fluffy rainbow mane. Pixy was released in January 2019. Her Birthday is on 26th May. There are two versions of Pixy. This small 6″ Flippable and a medium 9″ Flippable. Pixy was also released as a Beanie Boo without flippable sequins. The Beanie Boo version is available as a small 6″ Beanie Boo, a medium 9″ Beanie Boo Buddy, in a large 16″ size and as a key clip.